New Junior Sailing Director in Corona del Mar aims for sailing to take off in Southern California. CORONA DEL MAR ― Adrienne Patterson was born and raised in the seaside neighborhood of Newport Beach, known as Corona del Mar. Her experience growing up in Southern California with skilled sailing instructors and high-quality maritime training took her to national and world sailing championships. After living on the East Coast for the past 13 years, Patterson is back to teach youth sailing in her hometown. With a great deal of experience under her sail, Patterson has a passion to re-energize the sailing community. “I have high hopes to make a positive impact on Junior Sailing in Southern California. I would like to bring back the enthusiasm and participation level among junior sailors in Southern California. I believe we can do this by ensuring that we have highly skilled and enthusiastic coaches, organized Junior Sailing Programs, deliver quality sailing regattas both on and off the water, hold sailors to high standards, and provide the sailors with a platform where they can reach their maximum sailing potential and goals,” Patterson shared in an email to The Log. Patterson worked as a sailing director at Key Biscayne Yacht Club in Miami for the past seven years. “I had to basically start from the ground and work my way up to create a really solid foundation and eventually get it to a high-end racing program,” Patterson said about her experience at the yacht club in Miami. It was a very small sailing program when she arrived in 2010, with the summer program having around 60 children. The program, as of last summer, has since grown to about 250 kids, according to Patterson. When asked about the differences between East Coast and West Coast sailing – what with her experiences on both sides of the country – Patterson provided an interesting perspective. An organization called United States Optimist Dinghy Association, otherwise known as USODA, selected Patterson as a coach for Team U.S.A. while she was living in Miami. This provided Patterson the opportunity to coach Team U.S.A in Holland as well as Italy. College initially brought Patterson to the East Coast. She attended St. Mary’s College of Maryland where she was named 2007 Women’s Athlete of the Year. In that same year, she won the Women’s International Championship and was named Quantum Female Sailor of the Year. Prior to college, Patterson competed on the varsity sailing team at her high school in Corona del Mar and went to Nationals all four years. One of her most exciting accomplishments, according to Patterson, was winning the 2015 Team Racing World Championship in Rutland, England. Students on board during the spring session of the Junior Sailing Program. Patterson not only has national and international sailing experience, she also earned a master’s degree in teaching. After returning to Corona del Mar to teach youth sailing, Patterson received more exciting news. Patterson returned to Southern California to help bring back the enthusiasm of sailing on the West Coast. 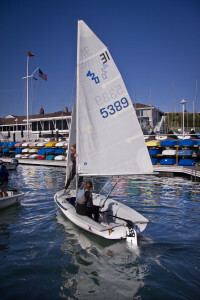 Patterson is currently instructing the spring junior sailing program at Balboa Yacht Club (BYC). For more information about the BYC Junior Summer Sailing Program, a brochure is available online.